Mucosal biopsy is considered the gold standard for the diagnosis of many diseases affecting the small bowel, especially those associated with malabsorption. Diseases such as celiac sprue, Whipple’s disease, and abetalipoproteinemia, which affect the small bowel diffusely, are readily diagnosed by biopsy of the small bowel. In taking jejunal biopsies, a suction capsule has been widely used; however, endoscopic duodenal biopsies are now most commonly used in investigating small-bowel histology. 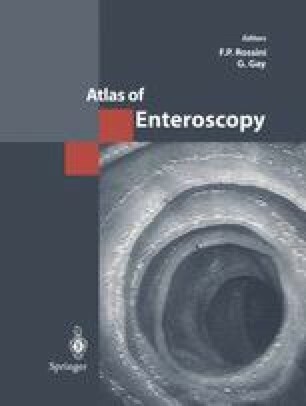 Endoscopic specimens are well recognized as being equally adequate as suction-capsule biopsies in the diagnosis of villous atrophy. Nevertheless, intepretation of proximal duodenal biopsy specimens in small bowel disease may be hampered by the normal occurrence of flattened villi and Brunner’s glands and by duodenitis, often present but usually irrelevant to any malabsorption process.